Otolaryngology is at home in the practice of Pediatrics, with common disorders in uncommon patients and uncommon disorders in common patients filling many of the moments in both primary and specialty care pediatrics. The broad spectrum of Otolaryngology disorders are seen at every developmental stage, from before birth – with congenital causes of upper airway obstruction, to choanal atresia presenting at birth to the ear infections of early childhood and neck masses and thyroid disorders seen in teens. These problems are best approached through coordinated care and interdisciplinary thinking. The eminent authors of this volume seek to elucidate and amplify these themes through their chapters in this eBook. The electronic format should facilitate rapid access and referencing, and promote better outcomes for children seen with otolaryngology disorders, and in maintaining the much travelled bridge between the worlds of otolaryngology and pediatrics. It is commonly known that many diseases and conditions of concern to the pediatric patient manifest in the region of the head, neck, ear, nose, and throat. As such, Otolaryngologists frequently work in partnership with their Pediatrics colleagues in the diagnosis and management of such conditions. Indeed, the subspecialty of Pediatric Otolaryngology is relatively young – flourishing in the last three to four decades. Advances in Pediatric Otolaryngology have come from an international collaboration focused on tackling complex diagnostic and surgical issues in less than ideal conditions (small anatomy, underlying genetic malformations, limitations of instrumentation, etc.). This eBook is written by eminent Pediatric Otolaryngologists chosen by the Editors for their specific research and clinical expertise in the conditions that they discuss. Each chapter provides a succinct overview of the clinical problem and its pertinence for the Pediatrician in managing such conditions. As expected, these are intended to be cursory discussions and of high clinical relevance for our colleagues. 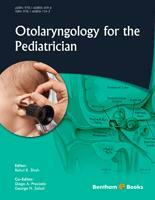 We sincerely appreciate the efforts of our authors and the publisher in helping this vision of an eBook dedicated to specific pediatric Otolaryngology conditions come to fruition. We are eager to share this with our health professional colleagues across the world and sincerely hope you find the content of pertinence and interest to the care you all provide.